PARKERSBURG, WV — Woodcraft Supply LLC is partnering with The American Woodshop, Delta Power Equipment Corp. and Porter-Cable to sponsor “The American Dream Shop Giveaway with Scott Phillips,” a prize package that totals $14,000. The “Dream Shop” tool prize package includes a 3-hp Delta Unisaw, left tilt, with a 52-inch Biesemeyer fence system; 2-1/4-hp VS Porter-Cable router kit with multi-base, Kreg Precision 24-inch × 32-inch floor model router table, Delta 12-1/2-inch 1-hp variable speed Midi lathe and stand, WoodRiver Ultimate bench plane and block plane kits. 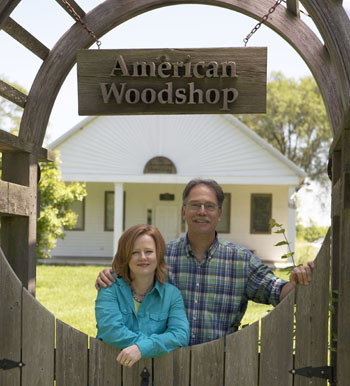 In addition, the grand prize winner and a guest will travel to The American Woodshop studio in Piqua, OH, for a one-day, two-night trip sometime between April 1 and 14, 2012, to meet Scott Phillips and his wife, Suzy, and spend a day observing the show’s production. For contest rules, prize list and entry forms, visit your local Woodcraft store or go to Woodcraft.com/dreamshop. Entries will be accepted at Woodcraft stores, online and by mail from Sept.1 through Nov. 30, 2011.The winner will be selected in a random drawing on or before Dec. 31, 2011.